As a part of the CSR activities LG is performing various development activities for the underprivileged people. For the last 4 years GNB was being the implementing partner for LG’s CSR activities in Bangladesh. Recently LG Bangladesh and Good Neighbors Bangladesh (GNB) jointly operated Mosquito control activities in the urban slam areas. 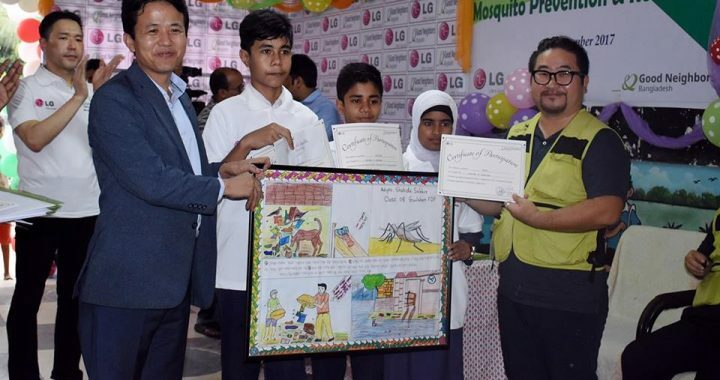 In line with this, LG donated Mosquito away AC to 3 different organizations. The organizations those received the donations included Ad-Din Hospital Dhaka, Chotomoni Nibash and BAAIGM (Bangladesh Association for the Aged and Institute of Geriatric Medicine). Each organization received ACs equivalent to USD 10,000 each. Through a program held at GNB Gulshan project on 17 September 2017, Mr. Edward Kim (Managing Director, LG Bangladesh), Mr. Hyun Jin Jeon (CSR specialist, LG) and Mr. Jeoung Sek Kim (Country Director, GNB) handed over the ACs to the representative of the above mentioned organizations. Later on prize was given to the participant of the poster competition and a small demonstration of making a easy mosquito killing trap was shown to the GNB school students.